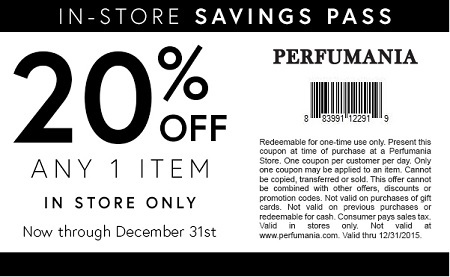 Enjoy shopping with printable coupon at Perfumania stores in the United States. Print a special in-store savings pass and receive 20% discount on 1 item. Source of the information is Perfumania. Offer expires 31/12/2015. More details available at Perfumania stores.